Attaching PDF’s to drawings can be somewhat of a pain. For one, the performance with panning and zooming is horrible. Wouldn’t it be nice to convert these PDF’s back to a DWG? Well there are programs out there to accomplish this. Once the PDF is converted back to a DWG, you can then edit linework and text as well. Most of these programs are fairly inexpensive. I have been introduced to a website that will convert these files for free!! – High quality conversions with lines, arcs, scale presets and texts preserved, and no need for further touch-ups. – Files of up to 40MB can be uploaded and converted quickly. – Everything is free – they support their selves via ads on the homepage (please, don’t be confused by them). You can start today by clicking here. Being Civil has blogged about another new feature in Civil 3D 2014. Keep in mind, that the closure between the surfaces does NOT affect the actual surface. It’s only for the QTO calculations. You can read more about it here. Why is My Linework Gray? It has been a while since my last posting to the Blog, and hopefully it will not be this long again. 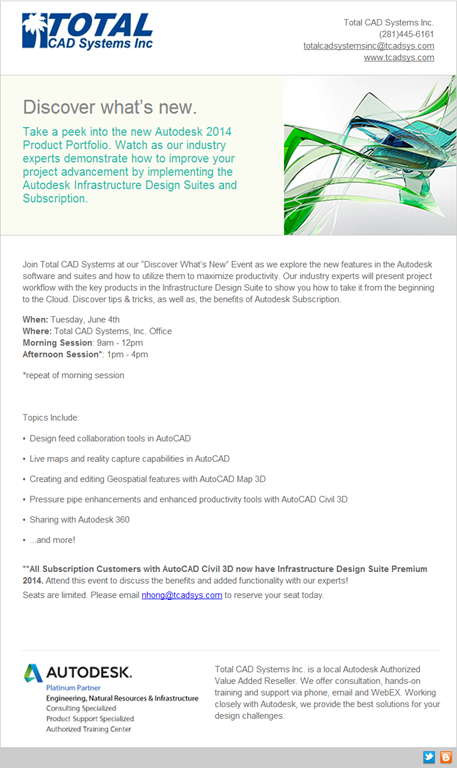 Total CAD recently had an Industrial Machinery workshop where we reviewed tools for Routed systems, Electrical schematic communication with Inventor, and a review of the Autodesk 360 tools. All in all it was a very good day for everyone. In our event some users saw tools they have never seen before, and these “missing” tools are good tools to know about. 1. While in routed systems and having created a run/route, highlight the route, right-click to see the menu and a couple handy commands, Convert to 3D sketch, and the Alternate Route options appear. Very handy. 2. Design Accelerators: Many users overlook these tools. Which appear in the Assembly ribbon tool bar… check it out. I recently had a client ask about chain design tools. Which is part of the Design Accelerator tools. Again very handy. While in an assembly select the “Design” tab of the ribbon. By the way, frame generator tools are here as well. 3. Learn to use the filter tools for content when searching for placement in an assembly – we see so many users struggling to look through 1000’s of parts because they don’t turn on ANSI, DIN, or other filters. With the Content Center open look for the little Funnel Filter button. Try it out, it will help. Also users can add commonly used parts to their favorites bar in Content Center. 4. Remember to expand folders in the part and/or assembly browser. If it has a “+” sign to the left, then other items are under that part or assembly. As you experiment I’m sure you will find efficient ways to use some of these tools. Now My CHALLENGE to you! Once a day pick a new button or command to investigate or use. Learn how it works and how it can be applied to your current design projects.